William Morrow Paperbacks, 9780062008121, 400pp. Jacqueline Sheehan made serious waves with her much beloved runaway bestseller, Lost and Found. 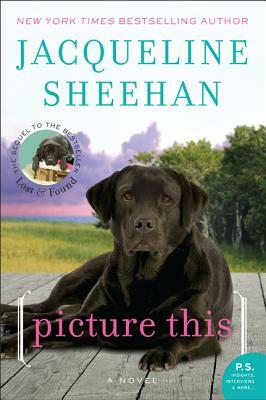 Now she treats readers to a sequel, Picture This—a story of rebirth and personal redemption that is as moving, funny, and heart-soaring as its predecessor. Peaks Island, Maine vibrates with its own special magic, a unique flow to life that knits together the small community that calls it home. The people, the animals, and even the houses have a charm and personality all their own. Just ask Rocky Pelligrino. Devastated by her husband Bob’s sudden death, she found hope thanks to a relentlessly loyal black Lab named Cooper. Warm friends and a new job—as the island’s Animal Control Warden—have helped Rocky chart a course toward a promising future. She’s even ready to try at love again with Hill, the gentle and patient archery instructor. And there is an old house haunted by lost love and forgotten secrets that speaks to her soul. But a phone call from a troubled young woman looking for her biological father shakes Rocky’s newfound joy. Could this young girl hold a tendril of the man who was the love of her life? Or could the girl’s appearance throw Rocky’s world into chaos . . . and shatter her heart again? Jacqueline Sheehan, Ph.D., is a fiction writer and essayist, the bestselling author of the novels Lost & Found and Now & Then. Currently on the faculty of Writers in Progress and Grub Street in Massachusetts, she also offers international workshops on the combination of yoga and writing. She writes travel articles about lesser-known destinations and lives in Massachusetts. Rocky is caught between wanting to start a new relationship with Hill and grieving the sudden death of her husband. Does it seem unimaginable to fall in love again after the death of a spouse, or would it feel like a second chance? Rocky is instantly drawn to Natalie in a way that seems to defy her psychological knowledge. What is it that pulls Rocky to the wayward girl? How does Natalie's background influence her behaviors with Rocky and with others on Peaks Island? The house that Rocky buys is brimming with personality. The house makes a wish when Rocky first stands in front of it. "Give me one more go at it." How does Rocky's decision at the end of the book answer this wish? How does Cooper respond to Natalie? If not for Melissa's photo, would anyone be able to detect his hesitation with Natalie? How is the micro detection of the camera like Cooper's perception of the world? What can the camera see that the naked eye cannot? Tess and her granddaughter Daniel are extremely close. Aside from sharing synesthesia (even though Tess loses hers after surgery), how else are their sensibilities similar? Natalie picks Daniel, the most tender spirit on the island, to include in her plan of revenge. Are there any other reasons why Natalie picks the child? Melissa is immediately suspicious of Natalie. How can teenagers see each other so clearly? In this story, who are the Tzadikum nistarim?